Naples, FL – The Freedom Waters Foundation has announced a date for the 2013 FWF Heels & Reels Girls Fishing Tournament held in conjunction with the PACE Center for Girls of Collier County. The tournament is to take place on Saturday, October 5th from 8 AM until 2 PM at the Naples Boat Club docks at 909 10th Street South. A rain date for the event is set for Saturday, October 12th. During this annual event, approximately thirty teen girls from the PACE Center for Girls of Collier County will be introduced to the enjoyment of sport fishing. 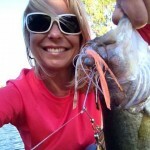 Each participant will be paired with an experienced female angler that can offer mentoring and instruction while on the water. Awards to be presented for most fish, biggest fish and most unusual catch. Volunteers and sponsors are currently being sought to donate funding, vessels, time and experience. For more information or for corporate sponsorship opportunities, contact Heels & Reels Tournament Chair Debbie Hanson at 239-233-4930. For details on donating to the FWF, please contact Debra Frenkel at dfrenkel@freedomwatersfoundation.org. FWF is a non-profit organization with the following mission: Enhancing lives through boating opportunities and marine related activities for people with disabilities, life threatening illnesses, youth at risk and others with special needs. Visit the FWF website at freedomwatersfoundation.org and “LIKE” the Heels & Reels Fishing Tournament on Facebook at https://www.facebook.com/HeelsReelsGirlsFishingTournament.